As I approach my first gigasecond, I've recently enjoyed noting a number of traditional "life milestones" occurring, vaguely on schedule. But just how "on schedule" should these milestones be? Given that there's only a dozen or so in a lifetime, it is reasonable to assume that there might be, among a population, some shot noise. Shot noise is where random jitter leads to apparent clustering. - C and I are expecting a sprog in August. - C started a new job at JPL doing cybersecurity for Europa Clipper. - We moved house to a lovely new place with awesome neighbours and lots of plants, and crucially more space. - I started a new job at JPL developing a next generation GPS receiver for all kinds of cool science. - We bought our first car together. 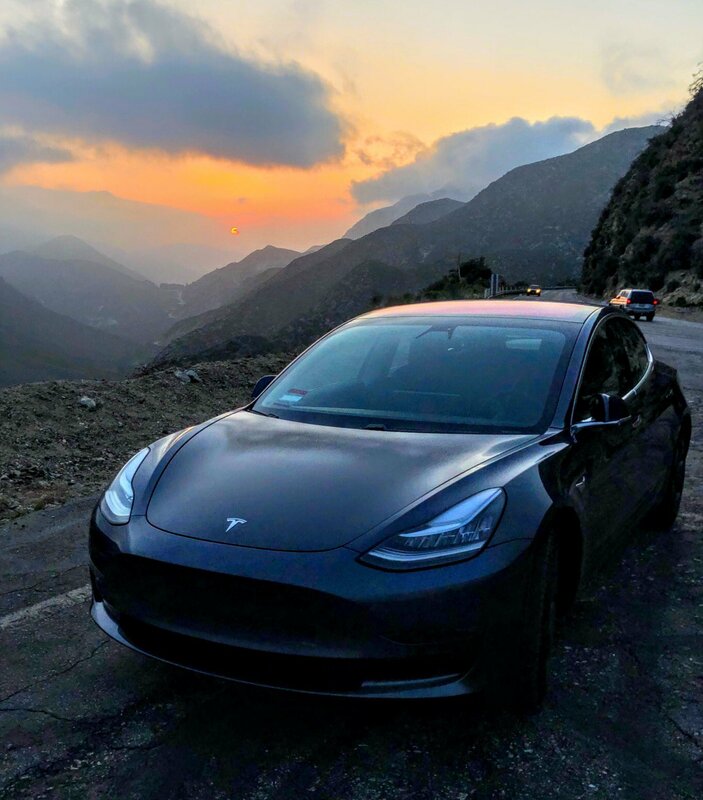 It was C's first new car and my first car, and it's an electric car - the Tesla Model 3. It's really pretty. We accidentally drove it to the top of a nearby mountain. It's also awesome to drive. Normally driving in LA induces tears of frustration interspersed with moments of round-eyed terror, but in the Tesla I find myself actually *looking forward* to driving. Obviously it's fast, comfortable, and has an app with which I can remotely set the interior temperature. But somehow it's more than that. Our previous car, a hand-me-down Infiniti G35 2005 sport sedan ("space car") fulfilled roughly the same segment 13 years ago - a fast 5 seat medium sized car with heated seats. I was just getting the hang of stick shift! Like all cars, its various features found an equilibrium that was heavy and sometimes challenging to drive, particularly in heavy traffic. The Tesla is based on an entirely different architecture, and so its inevitable engineering consequences result in a much more driveable car. And not just because two taps on the drive stalk engages autopilot! Of my peers I am by far the greatest laggard when it comes to buying a car, particularly in LA, where car ownership is nearly universal. For many years I was fortunate to live and work within walking or biking distance, and more recently I've occasionally used Lyft or Zipcar to go on longer trips. As someone who worked in the transportation space at Hyperloop for two and a half years, I'm keenly aware of the terrible toll that cars take on our lives and our cities. Cars exist as entities that are fundamentally incompatible with human bodies. They are much heavier, much faster, and much larger. The practical consequence is that designing a city that functions effectively with universal car usage and is also walkable is impossible. Even a city of any size that is car only is impossible. Like satellite internet, there is an optimal population density of about 100/sqkm (sparse suburb to semi-rural), beyond which either congestion or infrastructure costs become serious problems. Even a city like Houston, where about 70% of the land area (many billions in real estate terms) are devoted to roads, highways, driveways, and parking lots, suffers from crippling congestion. Cars can eat the whole city and still be hungry for more. Moreover, it's fairly clear that widespread autonomy will only make highway congestion worse, as the marginal cost of being stuck drops, encouraging yet more road usage. But there's only so much that a lonely crusade can achieve. With our family growing and our work place being surrounded for many miles only by houses that cost many millions of dollars, some degree of driving will be inevitable. So - a car. Why a Tesla? It's really expensive, even including the TSLA stock I bought back when it was trading at about $30/share. The trade in offered us $500 for our old car, which has a few scrapes. We could get a car worth 10x as much, such as a 2015 Prius and still be WAAAY ahead on cost. There are a couple of reasons. First, let's consider what Tesla is trying to do, and what industry more broadly should be trying to do. Gasoline (petrol) costs, on an energy basis, about 100x less than food. This is why it's possible to run something as big and heavy as a car on a modest wage. But gasoline is expensive in other ways. Money is, in some sense, only the first moment of value. By historical accident, gaseous waste products can be dumped for free, in a way that solid and liquid wastes simply cannot anymore. Look ahead 100 years, or 1000 years. The world, if a sensible technological civilization still exists, will have transitioned to renewable energy. Today, newer, less harmful technology is expensive, because the customer (me) has to internalize some costs that competitive legacy products externalize. Do I mind paying a bit extra? No, not really. If people like me are prepared to open their wallets for a better future, then we have a hope. In other words, what is good for my personal enjoyment is also good for building a market demand for less environmentally destructive industry. I don't think this is a new concept, but it is a concept that needs continuously shifting targets to be meaningful. Second, it's just so damn cool. The future is electric. Ever since I saw my first Model S prototype way back in 2011ish I've been hooked. This isn't even my first blog about Tesla. I even use battery powered power tools because I'm fascinated by wireless stuff and being able to work even where the cables don't reach. The ultimate expression of this idea is battery powered flight. Just this week, European aeroplane manufacturer Pipistrel obtained regulatory approval to sell their electric plane in the US - the first mass produced electric plane in the US. The Pipistrel has a lot of oomph, but again, think ahead. When I was a child, electric RC cars were a lot of fun. My brother and I salvaged a few and had many fun hours zooming them around the place. Battery powered cordless drills were also entering the market. And today we have a mass market human-sized electric car that crushes the competition. According to Tesla's earnings call today, the Model 3 is poised to become the highest selling premium sedan, and might even eventually eclipse the rest of the sector *combined*. About 10 years the Syma 107G toy electric helicopter entered the market, and today almost anyone can save and buy a professional quality drone quadcopter. Their capabilities are already pure scifi - the Skydio can autonomously track a moving human while flying through trees and branches. Some models are designed for long flights of more than an hour, while others are designed to fly quickly through obstacle courses piloted by humans using remote radio-transmitted video. A few years ago I got my pilot's license flying antique Cessna 152s. The Cessna is, mechanically and electrically, stuck in the mid 1950s. The general aviation market is tough for innovators in all kinds of ways, but pushing that bucket of bolts through the sky while flying a $50 drone around my house made something click. What electric power has done for cars it can do for aircraft too. Today, of course, electric aircraft can't fly very far, but batteries are improving and there is more to flying than crossing oceans. I look forward to affordable, ecologically sound supersonic flight using electric power. Back to the car, for whose name I am thinking "skylab". I've been thinking a lot about manufacturing and industrialization recently. It turns out that car manufacturing is, in many ways, a gold standard of a mature industrial economy. Making cars is really, really difficult. Making them well is even harder. The Tesla Model 3 is a miracle of manufacturing. No, it's not *flawless*. There are quirks of design that are well documented, and ours has slightly bulgy headlights. It is, afterall, one of the first ever built, since I queued up on day one more than two years ago. Persian rugs traditionally are hand made with a small imperfection so that the artisan can avoid the envy of the gods or hubris. In some ways, minor imperfections serve as a reminder that the car did not simply spring into existence, fully formed. It was made of obstinately uncooperative atoms forged in a supernova, mixed by geological processes, mined in nearly every country on Earth, and formed together into a single shiny, fast package only by the ingenuity and effort of humans. When Elon Musk announced the Model 3 two years ago, mass production was to ramp up in 2020. In response to more than 400,000 reservations within 24 hours, somehow they brought that timeline in two years. There is, of course, no shortage of skepticism in the press, but let's not forget that there are very few people who could speculate authoritatively about this car even six months ago, and even fewer who would. Yet dozens of self-appointed experts have rained a constant stream of pessimism since the earliest days of Tesla, 15 years ago. "Electrical cars are impossible." "American manufacturing is dead." "Tesla will fail before 1/2/5000 units of the S/X/3 are produced." "Tesla will run out of cash." "Consumers will never spend the money." What utter rot! The car exists. I encourage you to take a ride as soon as possible!